The 1709 Blog: So no full harmonisation plans after all? A few days ago the EU Commission unveiled its Digital Single Market Strategy (DSMS), a document detailing possible initiatives "towards a connected digital single market". 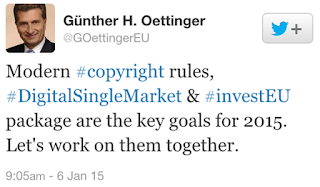 Despite earlier statements by EU Commissioners (see right), as far as copyright is concerned the DSMS has pretty narrow a focus and ambition. Proposed areas of intervention are only: cross-border access to "lawfully acquired" [so what about free streaming?] content and its portability; text and data mining for non-commercial and commercial purposes alike; and civil enforcement and the role of internet service providers (ISPs). Writing on IPKat, I expressed the view that the DSMS is fairly vague as regards the form of any proposed legislative interventions [a new directive? a regulation? or not even law, but rather soft law instrument instead? ], and overall contains fairly significant omissions. An example is whether copyright should be harmonised further, possibly till the point that an EU copyright title is adopted. "A Community copyright title would have instant Community-wide effect, thereby creating a single market for copyrights and related rights. It would overcome the issue that each national copyright law, though harmonised as to its substantive scope, applies only in one particular national territory. A Community copyright would enhance legal security and transparency, for right owners and users alike, and greatly reduce transaction and licensing costs. Unification of EU copyright by regulation [pursuant to Article 118 of the Treaty on the Functioning of the European Union] could also restore the balance between rights and exceptions – a balance that is currently skewed by the fact that the harmonisation directives mandate basic economic rights, but merely permit certain exceptions and limitations. A regulation could provide that rights and exceptions are afforded the same degree of harmonisation." Is full harmonisation something that current Commission is considering, also following the recommendations included in the draft Report by MEP Julia Reda? 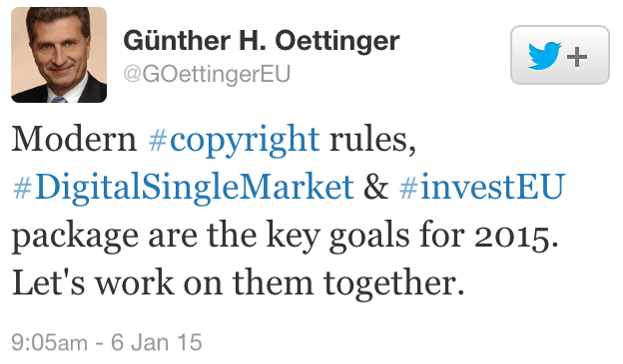 It would thus appear that adopting an EU-wide copyright is currently off the Commission's radar. In any case, if you wish to discuss further what EU copyright reform debate entails, you may be interested in attending - in person or even remotely - the event I am holding next week (26 May) at the London offices of RPC, entitled The Age of EU Copyright Reform?. This event will review both policy debate/initiatives in the area of EU copyright and recent decisions of the Court of Justice of the European Union in this area of the law. You can find further details and register here.